Galleon Blog | Spanish Properties: where foreigners bought in 2015? Where foreigners bought in 2015? Foreign buyers bought 17% of all homes sold in Spain last year, according to the latest figures from the Housing office in the Ministry of Public Works (Fomento), based on sales data from the General Council of Notaries. In absolute terms foreigners bought 69,196 homes in Spain last year. Expats are in a possession of an NIE (Número de Identificación de Extranjero), the necessary requirement for private property purchase in Spain. Non Resident are foreign-registered companies, who are not required to register in Spain. Of the regions most popular with foreign buyers, namely Catalonia (home to the Costa Brava, Barcelona, and the Costa Dorada), the Valencian Region (home to the Costa del Azahar and the Costa Blanca), Murcia (home to the Costa Cálida), and Andalusia (home to the Costa Tropical, Costa del Sol, and Costa de la Luz) on the coast, plus the Balearics and Canary Islands, and the Spanish capital Madrid, foreign demand went from a high of 40% of the market in the Balearics, to a low of 9% in Madrid, with a national average of 17%. According to these figures, almost one in five properties sold last year was bought by a foreigner. 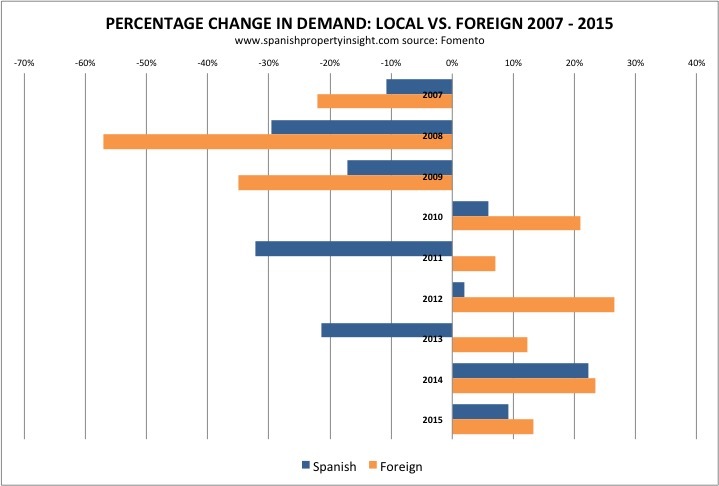 That compares to a number closer to one in ten recently published by the Property Registrars, who say that 13% of homes sold in Spain last year were bought by a foreigner (see British buyers stampede into Spain pushing foreign demand to record levels). Compared to previous years, foreign demand was up 13% last year, whilst local demand was up 9%. 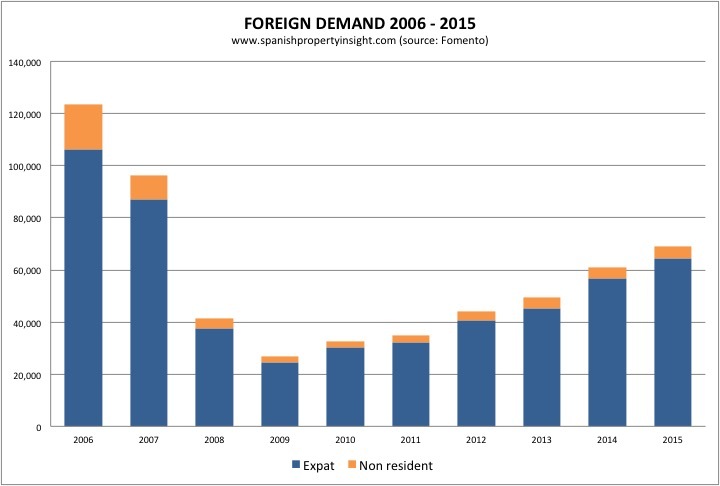 But compared to the year 2006, when economic migrants from South America, and climate migrants from Northern Europe – the UK in particular – were buying Spanish homes with gay abandon (123, 582 homes purchased by foreigners that year) foreign demand is still just over half of what it was. On the other hand, foreign demand has increased for six consecutive years, whilst local demand only rose in 4 of the last six years. Looking at the number of homes bought by foreigners last year, the Valencian Region was the most popular destination, with 20,269 homes bought by foreigners, followed by Andalusia (14,398), Catalonia (10264), the Canaries (7,286) the Balearics (5,061), Madrid (4,951), and Murcia (2,966), with a total of 69,196 foreign buyers in Spain last year (compared to 46,000 according to the registrars). By province, the Valencian Region’s Alicante province (Costa Blanca) was the number one spot, with 16,067 foreign buyers, whilst Andalusia’s Cádiz province (Costa de la Luz) was at the other end of the scale with just 877 foreign buyers last year.